Vifa Reykjavik review | What Hi-Fi? Technology takes ideas from nature all the time: wind turbines designed like whale fins, Japanese bullet trains following the slim, pointed beaks of kingfishers, and office complexes with ventilation systems like those found in termite mounds. Vifa has taken a more poetic approach when it says that the Reykjavik, the latest in its line of Nordic-themed wireless speakers, is ‘inspired by nature’. In this case, it’s a tribute to the fissured, flowy, foggy landscapes of the North Atlantic island. The result of this Icelandic inspiration is a pebble-like speaker, about the size of a CD pack, that feels durable enough that we’d be happy to take it out and about. It’s made of aluminium with a leather-like strap, and there’s also a version covered in wool. On the whole, it’s a rugged design, although we would prefer the strap to feel a little more substantial. Hidden inside the speaker are two 19mm tweeters, as well as a 7cm woofer for lower frequencies. Battery life clocks in at a claimed six hours, charged via USB-C.
There’s also a 3.5mm jack on the side too, in case you’d prefer to use a wired analogue connection. 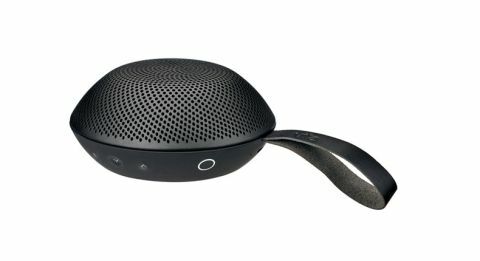 On the side, there are buttons that control Bluetooth connectivity, volume, and answer calls to your smartphone when you’re using the speaker. These look smart enough, but they’re difficult to use. It takes a fair amount of force to make the buttons work, and it’s hard to tell whether your action has been registered by the speaker. It’s also mildly annoying that the blue ring around the speaker’s pairing button – that turns on to indicate pairing mode – is covered by your thumb when you hold it down. We pair the speaker and let it run in for a couple of days, and immediately the Reykjavik charms us with its sound quality. It seems only fitting to start with some of Reykjavik’s own Of Monsters and Men. Capturing the delicacy with which Nanna Bryndís Hilmarsdóttir sings the opening lyrics of Organs is vital, and this speaker offers it up tenderly. There’s a good deal of texture to the fragile guitar strumming – the Reykjavik highlighting its soft, textured quality. Hilmarsdóttir’s naturally sibilant, almost whispering vocals are rendered with more sophistication than we’ve heard from similarly-priced speakers. Here, you can make out the way she strains her voice to emphasise her emotion – creating a greater sense of intimacy with the track. It’s also impressively well balanced, reflected by the way this speaker balances those clear vocals with the hum of low-frequency strings that come up midway through the track. Lesser speakers might allow them to interfere with the lighter guitar strums and twangs, but the Reykjavik keeps it all in check. We change to something more upbeat, playing Isn’t She Lovely by Stevie Wonder. The drums that kick the song into action are energetic and should get your foot tapping in no time. That tight timing is matched by a good grasp of bass as well; it has enough clout to highlight the differences between the drums’ thumps and patters, and you’ll be able to pick up the way the sound subtlely deepens and changes with each strike with a little more accuracy than its competition. The opening flurry of bass beats are given a commendable amount of space as they bounce around – making the track seem more open and wider then we would usually hear. Wonder’s vocals are given the scope they need to stretch into the room and come into their own, just beating the £150 Ultimate Ears Blast in that regard. That might be expected, as the Reykjavik is more expensive, but it’s pleasing to hear. But it’s not all positive news. The Reykjavik doesn’t quite have the same solidity or authority as the Blast. For all its subtlety, the midrange sounds a touch hollow to us. For style and sound, there’s a lot that the Reykjavik gets spot on. It’s built nicely and its audio accomplishments are some of the best that we’ve heard from an on-the-go wireless speaker. We can’t avoid the fact that, at £180, it’s significantly more costly than the Ultimate Ears Blast and isn’t as impressive when it comes to features – lacking Alexa voice control or true waterproofing. But if you can skip those features and just want a straightforward Bluetooth speaker so you can wallow in good music, the Reykjavik can certainly provide that.